There are three types of general body fur on the cat. The down hairs are closest to the skin and they keep the animal warm. This underfur has a soft and curly quality to it that gives it its excellent heat-retaining property. These are the shortest, thinnest, softest, and most numerous of the hairs. The stiffer bristle hairs form the middle coat. They lie between the soft underfur and the guard hairs of the topcoat. These bristly hairs share the functions of the insulating down hairs and the protective guard hairs. The guard hairs form the protective topcoat. They are the longest, thickest and straightest of the body hairs and serve to protect the underfur from cold and wet weather. For every 1,000 down hairs there are about 300 bristly hairs and 20 guard hairs. These ratios vary tremendously with the different breeds of pedigreed cats. Persians, for example, have excessively lengthy guard hairs, measuring up to 5 inches, and greatly elongated down hairs, but no bristly hairs. The Cornish Rex cat has no guard hairs and very short, curly bristly and down hairs. 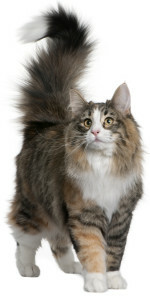 The natural coats of these and some other breeds of cats have been carefully altered through selective breeding to the point where they are attractive to humans but would not survive in the wild.